Three Leicas on display at the Ginza Leica store in Tokyo. From right to left: a Leica II that deflected a bullet and saved the photographer’s life. 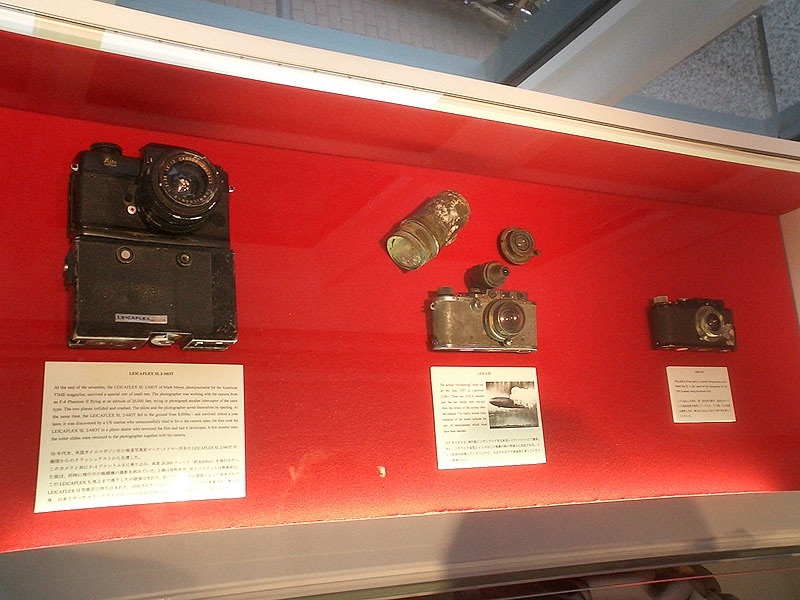 The middle camera is a Leica II with lenses found in the Hindenburg wreckage. To the left is an SL2 MOT with Motor and 35 mm Summicron that fell 25,000 foot (7600 m) from a Phantom II fighter jet. Battered but in one piece, and deemed repairable by Leica. This entry was posted in Collectible Leicas, Leica, Leica Camera, Leica Film camera, Leica History, Leica Screwmount, Leica Store and tagged Leica II, Leicaflex SL on November 21, 2015 by Leicaphila.